Warning: This feature contains major spoilers for Game of Thrones season 6 episode 2. If you haven't seen it yet, please turn away now. When it comes to resurrecting the dead everyone knows you need some special, spooky sounding words to say over the body or it won't work. 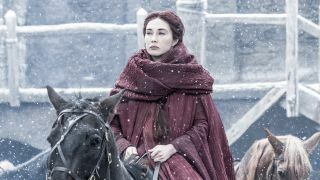 That's why when Melisandre brought Jon Snow back in this week's Game of Thrones episode, she repeated a prayer in High Valyrian. Now, I wasn't paying attention because I was too busy watching corpse Snow for a flicker of the eyelids, but since then one fan on Reddit has translated the words so we now know what she was saying. Melisandre says: "Hen sendruro oños, hen ñuqir perzys, hen morghot glaeson" which, according to this High Valyrian vocabulary page, translates as: "From darkness light, from ashes fire, from death life". Game of Thrones season 6 airs on HBO each Sunday in the US, and a day later on Sky Atlantic in the UK.